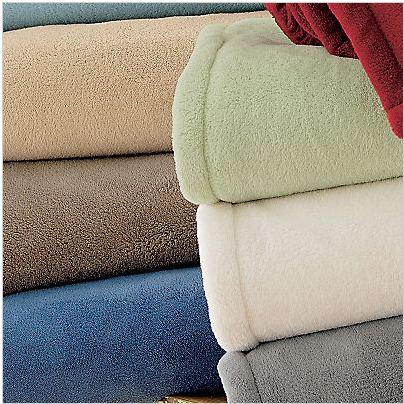 •You just have to feel this bedding to believe the deep down softness. •Sheets have a deep, plushy pile that makes them super warm, yet almost weightless against your body. •Sheet set includes flat and fitted sheets and two pillowcases (twin and twin-XL have one standard pillowcase, king has 2 king pillowcases). The recent FRIGID cold temperatures here in the North East U.S. are not exactly my favorite part of living in this area of the country. I love Spring, am a huge fan of Fall, and can tolerate the Summer, however the Winter makes me want to move some place WARM! I've been fairing a little better this year (and have managed to turn the heat down a bit at night) thanks to the incredibly soft, warm, and cozy Microfiber Fleece Sheet Set from The Company Store! I normally set my heat high (much to my husbands dismay)....and wear flannel pj's.... and double up on socks....I'm that kind of a gal, I need it to be super warm to be comfortable. After browsing through all of the great products at The Company Store, and reading the product description of the Microfiber Fleece Sheet Set I was intrigued to see what the Microfiber Fleece Sheet set was like in person. The pictures could never do them justice! After the sheet's arrived (very quickly) I eagerly opened them up right away, and WOW! They are comfy, and cuddly and so so soft! It's like being wrapped in a big warm bear hug! I originally thought that we would need to buy a new comforter this season (something bigger and heavier) however with the Microfiber Fleece Sheet Set on our bed, there is absolutely no need! They have added both incredible comfort & warmth, allowing me to turn the thermostat back a little at night (saving us money on our energy bills!). Available in several gorgeous color choices, the Microfiber Fleece Sheet Set from The Company Store (exclusive item to The Company Store) is a must have Winter Essential! To learn how to outfit your own twin extra long bed visit Twin XL Bedding.com for manufacturer direct savings and many more tips on choosing not only feather beds but comforters for your dorm room. twin xl bedding . These are very useful tips for buying twin extra log bedding.